On Easter Sunday, April 11, 1993, a riot broke out at the infamous Southern Ohio Correctional Facility at Lucasville. Lucasville had a reputation as one of the most violent and predatory prisons in the country. The prison and the atmosphere at the prison had become extraordinarily tense since the arrival of Warden Arthur Tate Jr. in 1990. Shortly after Tate’s arrival, he began dissolving almost all the programs in the prison. He stripped the college program down to the bare bones. He did away with the music and literary programs and a host of other positive avenues that men were using to do their time. Prisoners were required to march to chow, chapel, commissary, infirmary, recreation, school and work. In addition, prisoners, who had been celling in a particular block for years were forced to move to other blocks. Further, prisoners classified as Max 4s were locked in their cells after 6 p.m. and prevented from further participation in the vocational programs unless they had fallen under the grandfather clause. Rules were made up on a daily or weekly basis and not put into writing or issued to prisoners. To make matters worse, guards implementing these rules and regulations often abused their power and authority, causing more conflict. The prison was a tinderbox ready to be ignited. Simply put, overly rigorous constraints combined with ill-advised housing regulations, which randomly, selectively and forcefully integrated White Extremists in the same cells as Black Revolutionists had tension at an all-time high. Overcrowding was a contributing factor to the tension. Prison conditions had become so adverse and debilitating, they unnecessarily deprived prisoners of their rights and opportunities to rehabilitate themselves or even maintain the skills they already possessed. Tate declared that all of the aforementioned implementations were to make Lucasville “safer” for those confined there. But the record attests to the reality that the rapes, assaults, plunderings, beatings, stabbings and murders continued. Then Tate mandated tuberculin skin testing through a process which would require the Muslims to violate their religious tenets. The Muslims had been clear in their objection to the proposed procedure and equally clear that they would be willing to submit to chest x-ray, urinalysis, sputum specimens or any of a number of other tests which would not require the injection of phenol (an alcoholic substance) or any other unlawful substance or its derivatives into their system. Instead of honoring the Muslims’ request to submit to an alternate method of testing that would not infringe upon their religious beliefs, Tate refused to even entertain the possibility. Because he had absolutely no respect for the prisoners under his control and care, Tate adopted a hard-line approach. He made it known that he was boss and the testing was going to be conducted his way. In the week before Easter Sunday, the administration telegraphed its intention to lock the prison down the following Monday to accomplish the forceful testing of all prisoners who had not previously submitted to the TB testing. By doing so, they seemed determined to provoke a confrontation. On Easter Sunday they got a confrontation that resulted in a major riot that rocked the entire Ohio prison system. Rising as one, with racial differences ignored, the prisoners took control of the facility. Several guards were taken hostage in the process. For 11 days a standoff existed. During that time, nine inmates and one guard were killed. I along with many others have suffered as a result of the injustices of the Lucasville situation. Therefore, I am seeking support and assistance in the establishment of a Political Prisoner Support Network. I need individuals, groups and organizations willing to dedicate some time, effort and of course the necessary finances to our cause, which is to seek justice for all those wrongly convicted as a result of the uprising at Lucasville. Write to Edward Julious, Register No. 04762-000, U.S. Penitentiary, P.O. Box 5300, Adelanto, CA 92301-5300. 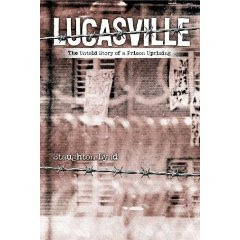 Staughton Lynd's definitive account Lucasville: The Untold Story of a Prison Uprising is one of the best accounts I have read of the dynamics of prison and provides both a good account of the uprising and equally important how the criminal justice system's response was itself a perversion of justice. I really recommend it as a must read of prison literature. The Introduction can be downloaded for free from here.